Get set for Summer with our latest competition! 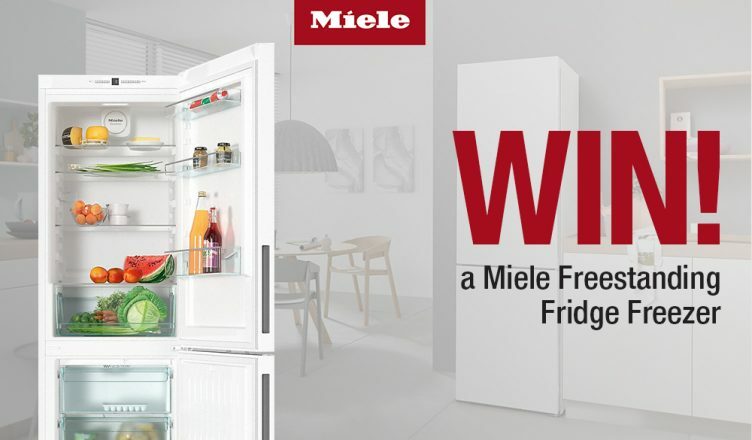 We’ve teamed up with Miele to bring one lucky winner a fantastic Miele KFN 28132 EDT/CS freestanding fridge freezer. Read on to find out more about this prize and how you can be in with a chance of winning one for yourself! When you buy a Miele appliance, you know that you’re getting an incredible piece of technology that’s been designed to stand the test of time. No fans of ‘planned obsolescence’, Miele’s appliances are tested to the equivalent of 20 years use so, look after your Miele and it will look after you and, quite possibly, be a money-saver. 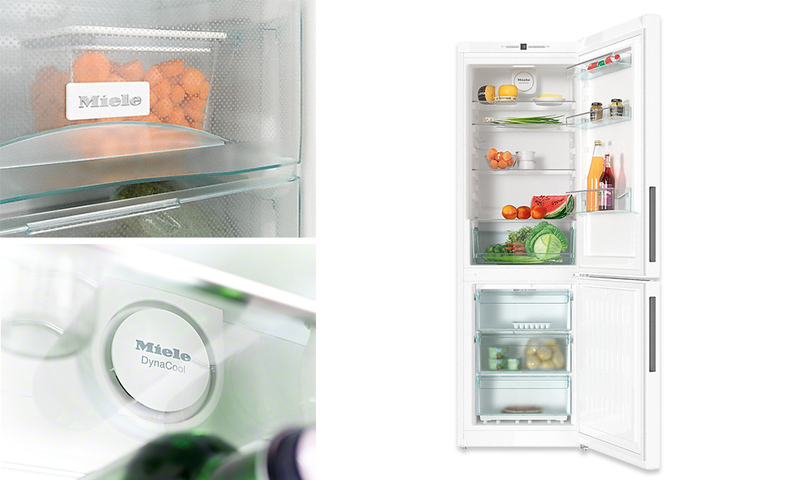 The Miele KFN 28132 edt/cs fridge freezer has amazing features that will preserve your food for longer. The 209 litre fridge and 95 litre freezer gives a combined storage of 304 litres – enough for a whopping 16 bags of food! It looks good, too, finished in modern white and with an integrated handle it looks sleek and stylish in both modern and traditional homes. Miele’s DynaCool technology ensures that your food and drink is stored at an even temperature, no matter where in the fridge it is. It’s not just about the temperature though, air humidity is important, too. Miele’s dynamic cooling features an integrated fan which uniformly circulates the air, thereby ensuring that the temperature and air humidity is evenly distributed. Like it or not, every fridge freezer needs to be cleaned regularly; there are some great cleaning products to help and – hurrah – Miele have used dishwasher-proof shelves on the inside of the door. Called ComfortClean, Miele’s door shelves are made from high-quality copolymer plastic; they’re scratch-proof, resistant to chemicals, temperature-resistant and highly transparent. What this means in practice is that they can be cleaned easily and hygienically in a dishwasher (up to 55 ºC). 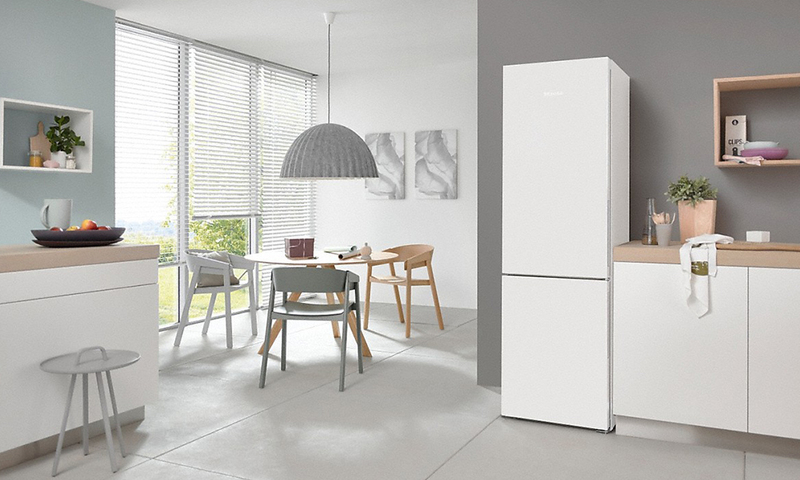 The freezer section gives you variable use of the space, thanks to Miele’s VarioRoom storage concept. This allows you to arrange the storage space in the freezer to suit you. VarioRoom is particularly useful if, for example, you want to freeze bulky items. The drawers and glass shelves are easily removed, allowing you to create as much space as you need in no time at all. To find out more and to be in with a chance of winning a Miele KFN 28132 edt/cs fridge freezer just head to our Facebook, Twitter or Instagram pages to find out how you can enter our brilliant FREE competition. You can also buy this Miele fridge freezer online, view our Miele range online or ask your local store about a demonstration. There you’ll discover exactly why Miele is such a coveted brand and winner of the Which? 2017 Best Home Appliance Brand of the Year.